Basic electrical wiring consist of many different elements. We’ll be covering the main components of home electrical wiring. Safety is first and foremost when electricity is involved. Before working on any electrical device, you’ll want to stop the flow of electricity to that device. You this by shutting of the breaker or removing the fuse. How do you know which breaker is supplying current to the element you are working on? One sure way is to turn the main breaker off (all power below this breaker is shut off). This is located in the service box above all other breakers, normally located in the middle top of the box. It should be labeled 100 or 200 depending on your service box. Do this if your going to work within the breaker box or you can’t figure out witch breaker or fuse is supplying the power to the device your going to work on. It’s not hard to figure out witch circuit (breaker or fuse) is supplying the electricity. Hopefully it is labeled on the back of the door of your service box. If not, you’ll need to do a little trial and error. Use electrical testing equipment to see if there is power to the device. Switch off breaker that supplies electricity to the device and test. Don’t have any electrical testing equipment, use a small appliance (sweeper, hair dryer, fan), anything that you know works. Plug it in. If it doesn’t work, you can be pretty sure there is no power to that device, unless it was incorrectly wired to begin with. To make certain there is no power, the best way is to use an electricity tester. Even if the service box is labeled, you should still check the device your working on for power. 110 volts powers the bulk of your homes’ electrical needs. Televisions, washing machines, lights, most plugs, and even gas stoves and gas furnaces, normally requite 110 volts. A 110 volt wiring system requires 3 wires. A hot, neutral and a ground. The hot wire supplies the power, the neutral completes the circuit, and the ground helps to prevent shock. Typically the wire should be red or black for hot wires, white for neutral and bare copper for ground. 220 volt electricity is required for only a few appliances. Never the less, it is needed if the appliance requires it. Most electric furnaces, electric hot water heaters, electric stoves, and electric dryers require it. The wiring system consist of 4 wires. A black and a red, both hot wires, and a white wire, which is neutral, and a ground wire witch is bare. Each of the hot wires are carrying 110 volts. Adding up to 220 volts. The neutral completes the circuit. The ground wire minimizes the ability of a shock. The breaker for a 220 volt circuit looks like 2 breakers in one. It has 2 wires, a red and a black, coming out of it. You can think of this as a double breaker, or 2 breakers in one. box or a breaker box. For now were going to be discussing a breaker box. breaker box. The elements of a breaker box are: a main breaker, hot bus bar, and the neutral bus bar. Breakers are added as needed. The breaker box does not come with breakers installed. They are bought separately for the breaker box and added as needed. 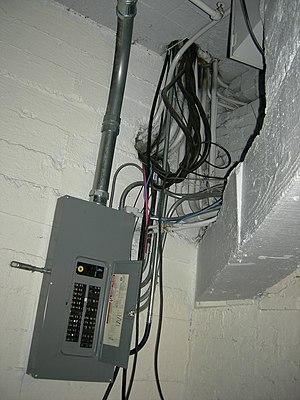 Chances are if you have a 200 amp service box, you’ll have room to add breakers. If you have a 100 amp service box, chances are you won’t be able to add many breakers if any, depending on the size of your home. The wires coming out of your service box are either hot (supplying the power), neutral (completing the circuit) or ground (protecting from shock). Think of it as a big loop. If you are powering a light bulb, and the loop is not complete, the bulb will not light. Even if you know the hot wire has power, and it is hooked to the wire on the light, but the neutral is not connected, the bulb won’t light. The neutral wire is equally as important as the hot wire. The ground wire is there to minimize the potential of a shock from the device.